Much of the Baby Boomer/retirement/succession dilemma revolves around money: the firm’s revenues, senior partner’s contribution to and control of client revenue, partner compensation and incentives to transition and other financial aspects of retiring partners. 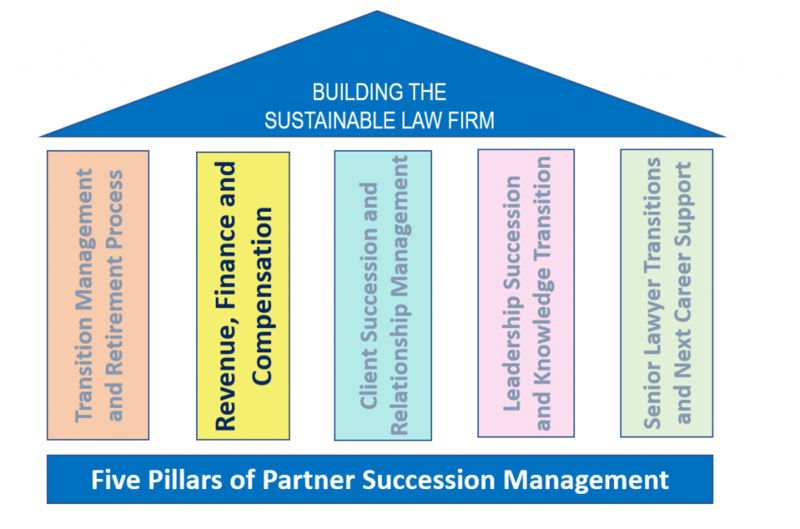 As noted in our recent post: Succession Management: The Problem and a RoadMap, we know that according to Altman Weil, 73% of partners don’t want to forfeit their current compensation and anecdotally, many partners say they cannot afford to retire. Whether this is due to unplanned expenses later in life, poor financial planning or management, children still in college, and unfunded retirements, this challenge likely is real for many partners. This is an important reason why many firms are now offering their partners financial planning and retirement planning services early in a partner’s career. We also know that in most firms, partners 60 and older still often control key client relationships and the attendant revenue (including the compensation/origination credit.) This puts significant revenue at risk if transitions are not made smoothly and with clients’ involvement and approval. This often amounts to 50% or more of a firm’s revenue. There are a number of steps and components firms should review to better understand and manage the financial aspects of retirement and succession. Client/partner revenue analyses. First produce a report on the firm’s top clients, those that produce 80% of the revenue. Second, associate each client with the partner that “controls” that relationship and establish the age of each partner. Third, identify additional partners that have significant relationships with the client and associated age of each. Establish financial goals and expectations. The managing partner or department chair should meet with each partner of a certain age (this varies from firm to firm from 55 to 62.) Once a partner’s timeline for retirement has been established, there must be a conversation pertaining to the timeline, the successors, billable contributions and scaling back, compensation expected, etc. Incentivize client transitions. While many firms balk at the idea, the reality is that in order for client transitions to occur, firms may have to double up on credit for a few years, i.e., the partner handing off the client gets credit for doing so, and the successor gets credit for becoming the responsible/originating partner. Both parties must feel incentivized. Capital buy-outs; unfunded or underfunded retirement programs. Every firm has a different structure to their partnership agreement in terms of the amount in capital accounts, when this can be withdrawn and whether they have funded retirement plans. Firms with funded retirement plans faced a crisis in recent years with the onslaught of retiring partners (many in firms with mandatory retirement) and the payouts that required. Most firms do not fund retirement anymore. Problem/Challenge 1: You are worried that your firm may lose a lot of revenue in the next five years due to partner retirements. How can you prove whether or not this is true? Problem/Challenge 2: Senior partners want options for reduced hours but don’t know what the firm’s policies are on phase down and also on capital buy-outs. How can you help? What should the firm put in place to address related policies? Problem/Challenge 3: Senior rainmakers hold onto client work and billing responsibility because they don’t want to be penalized in compensation. Your firm doesn’t have any way of measuring and rewarding partners who transition relationships to next generation.